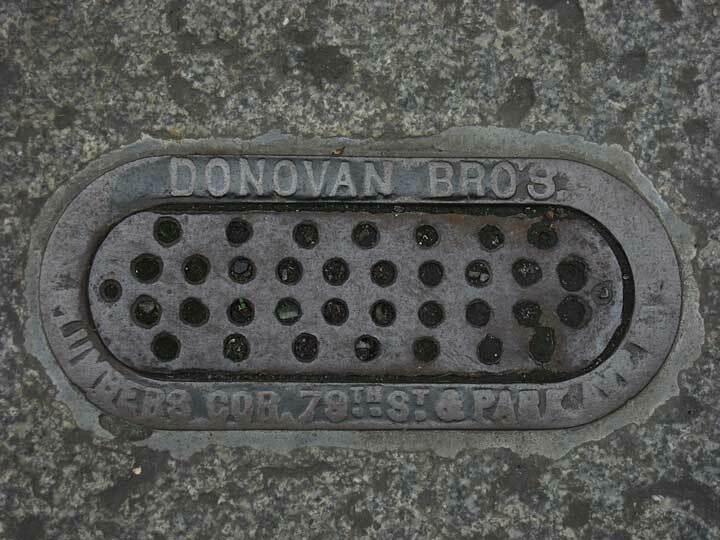 Donovan Brothers, Plumbers, were established at 101 E. 79th St., New York City, in 1891. They were at this address until 1909 when they moved to 175 E. 79th St., where they stayed in business until 1918. The brothers were Daniel J. Donovan (1863-1901) and James J. Donovan (1868-?). The City Record, 17 Feb. 1894, p. 582, recorded "Daniel J. Donovan and Jas. J. Donovan, composing the firm of Donovan Bros. / Plumbing and gas-fitting of Reception Hospital at the foot of East Sixteenth street, and of boiler-house, 676 feet east of Avenue C and north of East Sixteenth street / cost $3,490.00 / payments to Dec 31, 1893 $775.25." A similar record, 20 Sept. 1900, p. 5666, noted "Daniel J. Donovan and James J. Donovan, composing the firm of Donovan Bros. / For the alterations of plumbing work of Hook and Ladder Company 27, at No. 766 Amsterdam avenue, in the Borough of Manhattan New York City." Daniel J. Donovan appeared in the 1900 U. S. Census, age 37, born Feb. 1863, and living at 115 E. 83rd St., Manhattan. A notice of his death (The Metal Worker, 26 Jan. 1901, p. 51) read, "Daniel J. Donovan, of Donovan Bros., Seventy-ninth street and Park avenue, New York, died Wednesday of acute Bright's disease. His funeral took place from St. Ignatius church, Eighty-fourth street and Park avenue, Saturday, at 10 a. m. Mr. Donovan was one of the old members of the association." James J. Donovan appeared in the 1900 U. S. Census, age 31, born Dec. 1868, and living at 228 E. 87th St., Manhattan. Ten years later, in 1910, he lived with his sister, Margaret Donovan, at 2595 Bainbridge Ave., the Bronx. In 1920 he still lived with his sister, but now at 2031 Valentine Ave., the Bronx, and his occupation was recorded as "Inspector, Buildings." Apparently he was an inspector for the New York City Dept. of Buildings, as well as running his own real estate business at 529 Cortlandt Ave., the Bronx (later 603 E. Tremont Ave., the Bronx). This business appeared in the New York City telephone directory through 1928. The Polk New York City Directory for 1915 identified James J. Donovan and Frederick W. Lorch as company officers in James J. Donovan, Real Estate. Frederick Walter Lorch (1874-1957) registered for the World War I draft in 1918 when he declared that he was 44 years old, born 24 August 1874, and lived at 2592 Creston Ave., the Bronx. He lived at this same address at the time of the 1920 U. S. Census. His death notice (New York Times, 4 Feb. 1957) read, "Pelham, N. Y., Feb. 3 - Frederick W. Lorch, a retired real estate broker, died yesterday in New Rochelle Hospital after a stroke. His age was 83. Mr. Lorch, who lived here at 541 Third Avenue, had maintained a brokerage firm in the Bronx for many years until his retirement in 1932. He was born in New York. Surviving are his widow, Mrs. Laura Brechter Lorch; a son, Paul; a daughter, Mrs. Joseph L. Auer; five grandchildren and four great-grandchildren."